This entry was posted on Monday, March 3rd, 2008 at 11:32 pm and is filed under websites. You can follow any responses to this entry through the RSS 2.0 feed. You can leave a response, or trackback from your own site. So Where is Your Library? 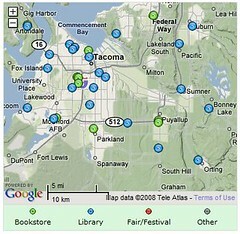 Check out what LibraryThing has just added as of yesterday: LibraryThing Local. Man, this thing is awesome and super easy (I added my library in all of two minutes). I see huge potential in collaborating with other libraries and bookstores in the area….